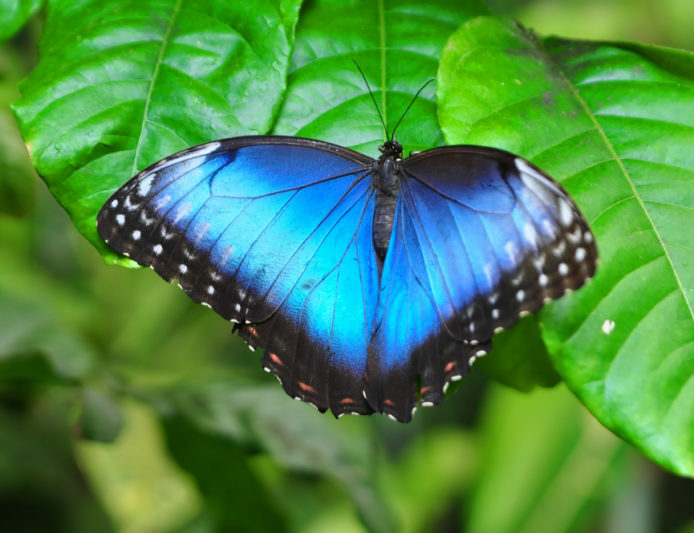 The Blue Morpho, besides being a great name for a drink, is the most famous of Costa Rica’s 1200+ species of butterflies. It’s also the biggest, with iridescent blue wings that can measure up to eight inches. That’s longer than your ordinary remote control! But this flyer has a dark side – dark brown in fact, with multiple eyespots. These camouflage the Morpho when it’s resting with wings closed, protecting it from predators like birds and insects and lizards. Like a glamorous undercover agent, with a flip of the wing, the Morpho can morph back from dull brown to dazzling blue. And when it flies, its color flashes between blue and brown, creating the illusion that the creature is rhythmically appearing and disappearing right before your eyes. Don’t you wish you could do that? While not officially endangered, Morphos are threatened by deforestation and by collectors who prize their colorful patterns. So enjoy the view, but leave them there. If you want to see them closer to home, look for one of the many butterfly habitat exhibits that have started fluttering around. New York’s Museum of Natural History’s annual butterfly exhibit has become one of their most popular shows. Meanwhile, you can treasure the sight of their magical flight in their native Costa Rican rainforest, where they mate and eat and . . . well, that’s about it. Nice work if you can get it.